2.12.14 | Oh Look! It's A Blog! 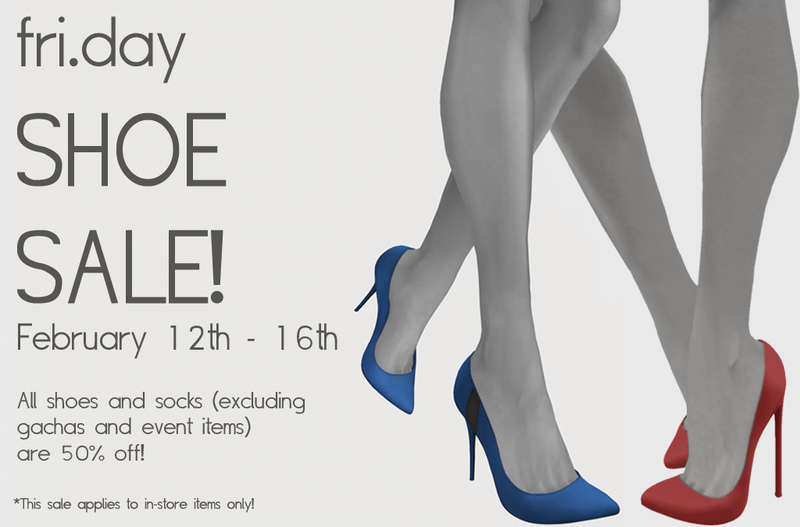 Fri.day is having a shoe sale which started today and runs only til the 16th. 50% off! I put together a photo in my living room that I am currently setting up ( will blog it within the next few days ❤ ) to show off my favorite pair of Fri.day shoes – the Miranda heels. There are also flats, boots and socks/leg warmers all included in this sale too! Here’s all the shoe details, the living room will be blogged within the next few days! * all shoes shown use either Slink medium or high feet. This entry was posted in iheartslFeed, Uncategorized and tagged 50% off, Amerlia, blog, Clara, Fri., fri.day, Maggie, Mesh, Miranda, Sale, Second Life, Shoes, Slink. Bookmark the permalink. Pingback: 2.20.14 | Oh Look! It's A Blog!